Our independent restaurants are dedicated to serving fresh, artisan quality food in generous portions. We serve hand-tossed Neapolitan style pizza, the freshest salads, and the most delicious sandwiches, appetizers, and desserts. All of our food is made on site and from scratch – our own dough, ground meats, sauces, dips, dressings, and brownies. 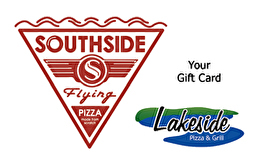 For balance inquiries call the phone number to a Southside Flying Pizza's location below.